When you live in a hotel, it is hard to find real foods that you can cook and eat! One of my favorites is Quinoa. It has more protein than most rice and noodles, but is still easy to make with just an electric kettle! Plus, if you cook it on Sunday you can store it in the fridge for easy salad making throughout the week! 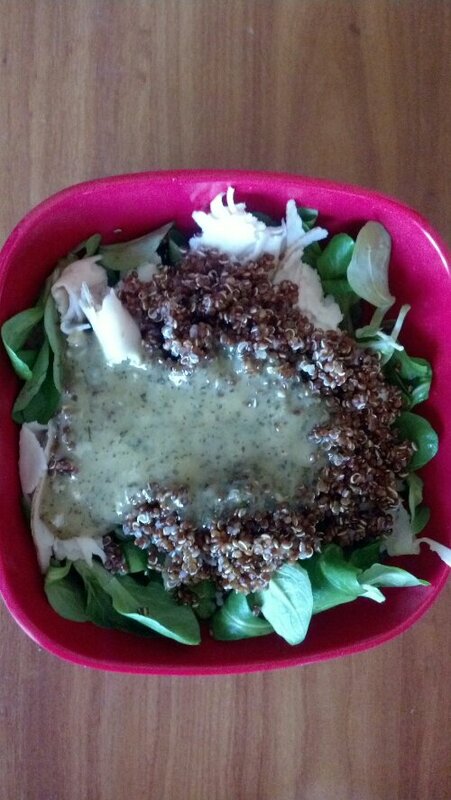 When I’m really lazy I go for just Greens, Quinoa, Chopped Turkey Breast, and some Trader Joe’s Green Curry to add flavor. When I have more time I can chop peppers and cucumbers, and add garbanzo beans to the above mix to make a tasty salad! Super easy and great for nutritional value! 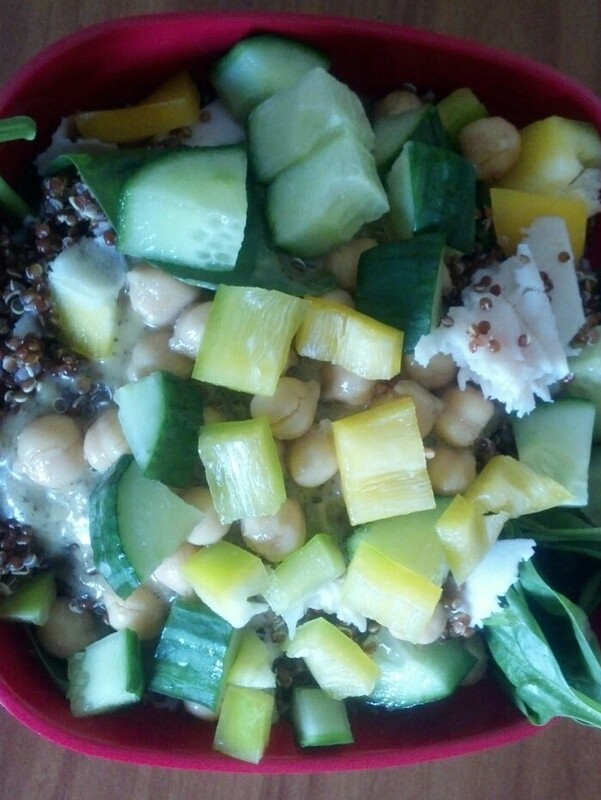 This salad is 450 calories, 41g Protein, 39g Carbs, 10g Fat, and 11g of fiber. A good filling meal within your ratios and easy to make! 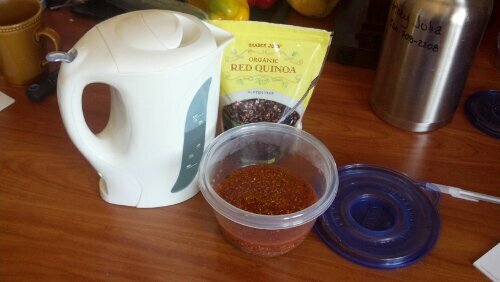 One more option would be to mix Trader Joe’s Madras Lentil (again another food that cooks well in the electric kettle. Just put the pouch in the boiling water), with your premade quinoa, some canned salmon, garbanzo beans, peppers, and spinach for another Quinoa Salad variation. 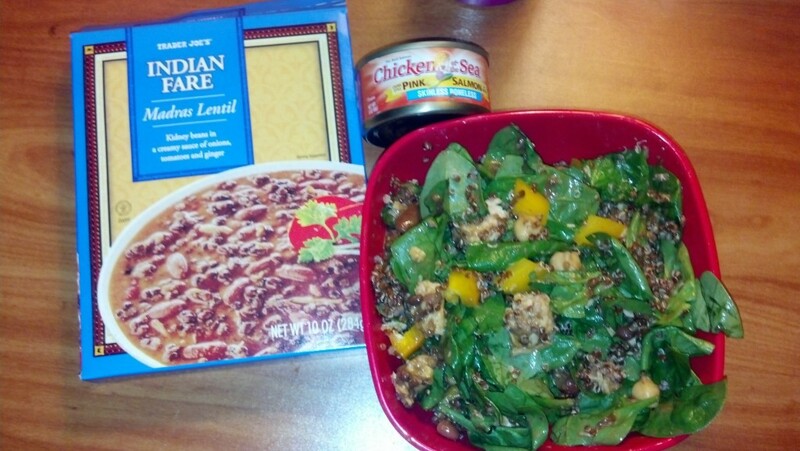 This meal has 450 calories 1og Fat, 58g Carbs, 32g Protein, and 15g of fiber! 1 staple food with 3 easy options! Good for hotel living or easy lunches during your work week!